Need a place to go to get the solutions you've been craving? Management Fix is what you've been looking for. 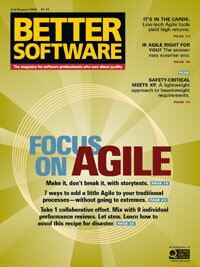 In this issue, find out how to bring old-school QA practitioners into the new world of development. To continue our series exploring what it means to care about quality and to build better software, we spoke with a software user who now collaborates with developers on Agile projects. Find out what she had to say. One man's love/hate relationship with index cards, a common tool of the Agile trade. Turn to The Last Word, where software professionals who care about quality give you their opinions on hot topics. This month, find out why Karl Wiegers thinks that Agile development is not to be undertaken lightly. We're pleased to bring you technical editors who are well respected in their fields. Get their take on everything that relates to the industry, technically speaking. In this issue, guest technical editor and Agile authority Mike Cohn explains how Agile development could help you recognize and overcome constraints that you never may have considered before. Collaborative projects are a cornerstone of Agile development, but how can you recognize individuals for team work without spoiling team unity? Learn how to dole out praise and rewards without leaving a bad taste in everyone's mouth. What if, instead of using tests to try to break software, we used tests to make software? That's the vision of storytest-driven development. We spoke to people who spend each day turning wishful thinking into working products. Find out how they do it. For some, a radical shift to Agile is out of the question. That doesn't mean that you can't take little pieces of the Agile philosophy and incorporate them into your traditional development scheme. Find out how even small changes can bring about big improvements.